Stinky little Wilson won’t brush his hair, wash his paws or change his underwear. Nobody wants to stand downwind of this smelly little wolf. Will he ever change his whiffy ways? Phew – let’s hope so! 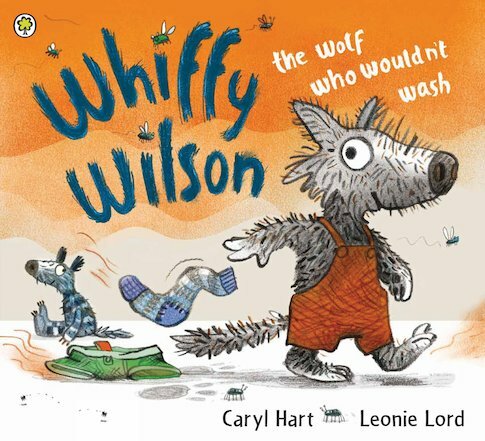 A laugh-aloud rhyme packed with grubby details, written by the brilliantly talented Caryl Hart. Colouring, drawing and puzzles to bring Whiffy Wilson to life. Use your best pencils to colour this lovely picture of Whiffy and Dotty playing in the mud! Design and draw a germ here! Can you tell Whiffy Wilson how to stay clean? Can you match these Whiffy Wilson pictures to their shadows? Help Whiffy Wilson get to the soap so he can go out to play! Where do pongs and germs lurk on Whiffy Wilson? Can you spot four differences between these pictures of Whiffy and Dotty? Caryl Hart is the award-winning author of fantastic picture books like Supermarket Zoo and Don’t Dip Your Chips in Your Drink, Kate. Caryl Hart won the Sheffield and Rotherham Children’s Book Awards for Don’t Dip Your Chips in Your Drink, Kate!.